Lightning strikes! 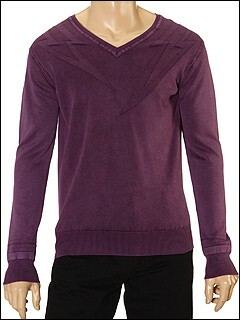 Electrify with the energy of this 'Kirol V-Neck Sweater' by Diesel. Lightning bolts on each shoulder. Ribbed v-neck. Long sleeves. Ribbed cuffs and bottom hem. Dark patch on the back lower right side of the sweater. 100% cotton. Machine wash cold, reshape, and lay flat to dry. Imported.